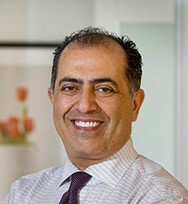 Dr. Fredrick Farahi, a native of Northern Virginia, received his Doctor of Dental Surgery degree from Howard University in Washington D.C. in 1990. Since then, Dr.Farahi’s continuing education has ventured him toward more challenging areas of Dentistry, including Cosmetic Dentistry, Reconstructive Dentistry, and Implant Dentistry. He has continued his passion for dentistry through the prestigious post graduate institution, The Las Vegas Institute (LVI) for advanced dental studies in Neuromuscular Dentistry and aesthetic Dentistry. Dr. Farahi is passionate about keeping up with the latest advances in dentistry. To stay on top of his field, Dr.Farahi completes hundreds of hours of postgraduate dental education every year. Dr. Farahi was voted “Top Dentist” in McLean by Northern Virginia Magazine from 2003 until present. He was selected by Consumer Research Council of America as one of “America’s Top Dentists”. He is an active member of the American Academy of Cosmetic Dentistry, Academy of General Dentistry, American Dental Association, Virginia Dental Association and Northern Virginia Dental Society. Dr. Farahi is married to Dr. Etessam, who is a Pediatric Dentist and they have four children. They especially enjoy providing pediatric service to their community.